Last night, Filmcore correspondents Armani Barron and Alex Kirschenbaum, as well as former Monkees drummer Mickey Dolenz, bravely commandeered a specially modified 1983 DeLorean DMC-12 at 88 miles per hour, running a flux capacitor at 1.21 gigawatts of power, into a dark and terrifying possible future (preventable only if young people vote): a Donald Trump presidency. We stumbled upon a missive from the Trump administration to the general public, a guide to the films that a Trump government actively sanctions and encourages schools to showcase — and to the movies that this future government has banned. Here they are, then, for your appraisal. The text is unaltered from the official missive. A movie about a winner who knows the art of the deal. People are saying that the napkin scene where Richard Gere’s character and his nemesis write down the prices they want on a napkin (Gere is trying to sell his company), is based on a scene right out of President Trump’s life when he sold his Palm Beach home to Russian billionaire Dmitry Rybolovlev. It’s possible Mr. Trump invented the napkin negotiation, we don’t know, that’s what people are saying. A great film that serves not just as a terrific, first-rate entertainment, but also as a de facto tutorial for American children to learn how to be winners. Look, it’s not fraud if you come out on top. All Americans should see this film to understand what our nation’s new capital, New York City, would be like if you had too many Democratic policies in place. We’re talking no zoning or rule of law, abortions everywhere you turn, dogs and cats living together, and criminals with eye patches taking charge. The Plaza would never be duped by a kid that easily, no matter how adorable and Aryan that young man may be. Well maybe it would now that it’s owned by some Arabs from Qatar or wherever. By the way, President Trump made a killing on that sale, we’re just saying. Anyway, no kid would get away with a bill that large without paying it. In this country, under President Trump, there are no deadbeats. But it’s a funny movie, and President Trump was even nominated for his cameo in it by all the big critics’ groups and award bodies before telling the Oscars and everyone else that he didn’t think it was fair to the other actors and graciously backed out. 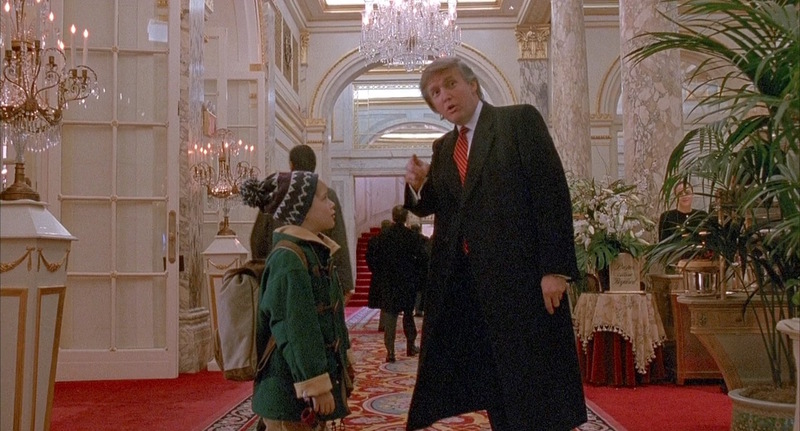 Donald Trump is a great, great actor. The best Disney movie of all time, one that was subsequently banned for its perhaps too-keen awareness of the true racial hierarchy that was deemed too “politically incorrect” by the so-called “liberal elite.” Barack Obama is personally responsible for Disney banning this movie, that definitely didn’t happen decades before or anything. It is only thanks to the Trump administration’s dogged efforts that this film enjoys its current ubiquity. Incidentally, “Song of the South” is First Child Baron Von Trump’s favorite film. President Trump is a great Christian – and he is. He is. Remember that. President Trump has a great relationship with God. More proof that Jews cannot be trusted. In our new and improved “America Is Great Again” cut, you won’t have to sit through Whinin’ Charlie Sheen crying about his dad’s job when he’s about to make millions of dollars! Watch as Michael Douglas buys the airline Martin Sheen works for, promises to develop the company, and then immediately plans the liquidation of all its assets. That’s called getting your cash value. A movie about losers and one okay guy, who have been failed by Democratic policies. We don’t need those stories anymore, let’s tell the right stories, the ones about winners. Also if that athletic kid bothered to use his 2nd Amendment right and own a gun he probably wouldn’t have thrown his future away in letting those guys shoot him. This administration has no problems with the Biff Tannen character and his likeness to Mr. Trump or the amazing representation of the world under which a Trump regime would look like. That being Saudi the administration does object to Biff’s being cruelly vilified by writer/director Bob Zemeckis and writer/producer Bob Gale. Biff’s tasteful mansion at the center of town and his exciting casino empire are treated as if they’re somehow un-desirable, which is just outrageous. If Zemeckis and Gale get to pick such an unrealistic attitude towards Biff in that film, nothing you can do, folks. Although the Second Amendment people — maybe there is, we don’t know. When do we beat Mexico at the border? They’re laughing at us, at our stupidity. And now they are beating us economically. They are not our friend, believe me. But they’re killing us economically. The U.S. has become a dumping ground for everybody else’s problems. When Mexico sends its people, they’re not sending their best. They’re sending people that have lots of problems, and they’re bringing those problems with us. They’re bringing drugs. They’re bringing crime. They’re rapists. And some like Salma Hayek, I assume, are good people. This movie serves as a reminder to what our “amigos” in the south are up to. Even their musicians are violent. American musicians aren’t violent. Is it, though? George Bailey, a loser who entrusts his family business to Crazy Billy Bailey, his loser uncle, at a crucial juncture in the film, spends this whole movie trying to destroy enterprising businessman Mr. Potter’s great, great renovation plan for Bedford Falls. Potter’s scheme to upgrade Bailey’s dumpy hometown into the utopic mid-century gambling paradise of Pottersville is one of the cruelest monopoly blockages ever depicted in fiction. Why Clarence the Angel-in-Training believes he has any right to interfere with that wimp George’s suicide is a complete mystery to this administration. Who doesn’t love Tom Cruise? We love Tom Cruise don’t we people? But instead of getting to enjoy some Tom Cruise, we have to deal with his messed-up Jewish brother. And this administration is just pointing it out that he’s Jewish, it’s not necessarily a bad thing. Some Jews are bad of course, maybe he is too, unclear. But he’s always repeating himself and not making any sense. Who needs that? Just let Tom be Tom and run around for two hours, without being burdened by a socially-challenged Jew who might steal his money, maybe, it’s hard to say. No one needs to hear about how people profited off of the housing crisis of 2008 and how the American people became losers. Disgusting Communist propaganda, designed to besmirch the good name of authoritarian governments everywhere. Trusting one man, who has all the answers and will fix everything, is actually the most effective way to run a country. We’ve done the research. Believe us.